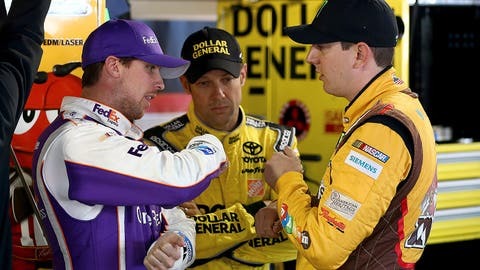 Teammates Denny Hamlin (left), Matt Kenseth (center) and Kyle Busch (right) could each be a force next season. Obviously, as we head toward the New Year and the beginning of the 2014 season, every team will have its sights set on one goal. That goal is to knock off Jimmie Johnson and the No. 48 team. Who can do it? Well, that’s a championship-winning question. Right now, I will give you a general answer — Joe Gibbs Racing. Matt Kenseth had an unbelievable first year in the No. 20 car. Did he close the deal? No, he didn’t win the championship, but trust me, 2013 far surpassed what anyone over there had hoped for the No. 20 car in its first year with Matt. Kyle Busch was strong and had a great Chase. He seems to get more and more mature, and his results in the Chase prove that out. Each year he just seems to get better and better in the Chase. I also know how hungry Kyle is to win his first NASCAR Sprint Cup championship. That’s not to say his teammates aren’t, but I know the fire that burns in Kyle to win our sportâs ultimate prize. So he could be the guy standing in Jimmie’s way in 2014. Denny Hamlin started the season strong, but the back injury from the Fontana race set the tone for the rest of the season. The tone was called miserable. Although he started really strong the first two races when he returned from his injury, it just seemed like that No. 11 car was jinxed. With that said, Denny and the No. 11 bunch changed the tone by winning the last race of the year. So if you ask me to lay odds in Vegas — which, ironically, I will be in Las Vegas this week — I would put money on one of those three JGR cars, if not all three of them, to make a strong run at unseating Jimmie and keeping him from that seventh championship.